If you are not a member but are keen on running and are interested in the benefits of joining a club, why not come along to one of our sessions, enjoy the atmosphere and meet new friends too? If you would like to come down & try a session with us completely free of charge & with no obligation to join, please use this form & one of the TBH coaches will get back to you. We have different groups to suit everyone’s ability, each group has different sessions. Our Coaches take pride in helping their runners achieve personal bests and competing in races. 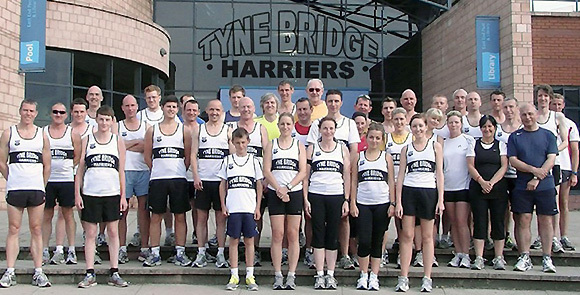 Tyne Bridge Harriers is not just a running club it is a community of socialising too. 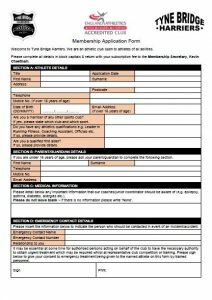 Once you have completed the double-sided form, bring it along and hand it in at one of our sessions. * Any member affiliated for the 2018/19 year re-joining after 1st October will not be entitled to the concession rate and will be required to pay the full membership of £55. Payment details can be found on the Membership Application form. The Committee has the discretion to waive or part waive membership fees for those members (new or existing) who may be experiencing difficulties with payment. Any queries in relation to this will be dealt with on an individual basis and in the strictest of confidence. Please speak to any Committee member for further information.